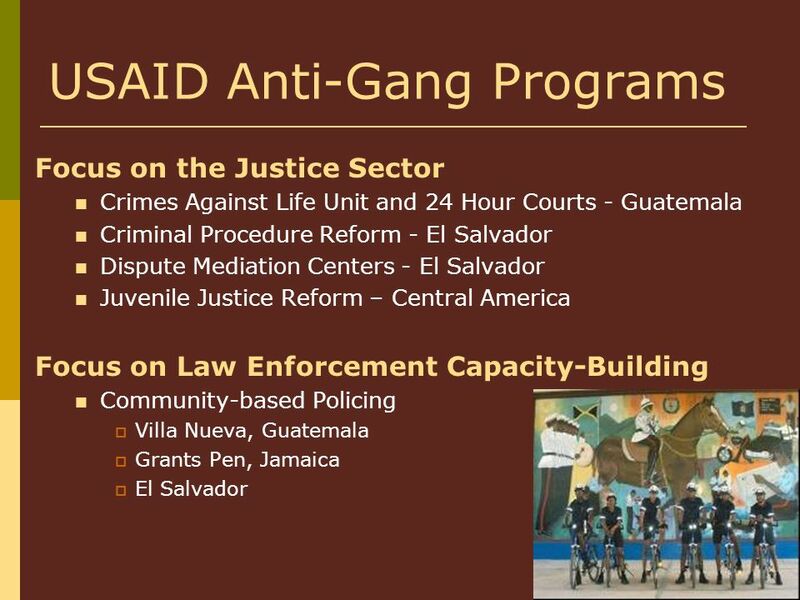 Second Special Meeting on Criminal Gangs Toward a Regional Strategy to Promote Inter- American Cooperation March 2, 2010 USAID Gang Prevention Activities. 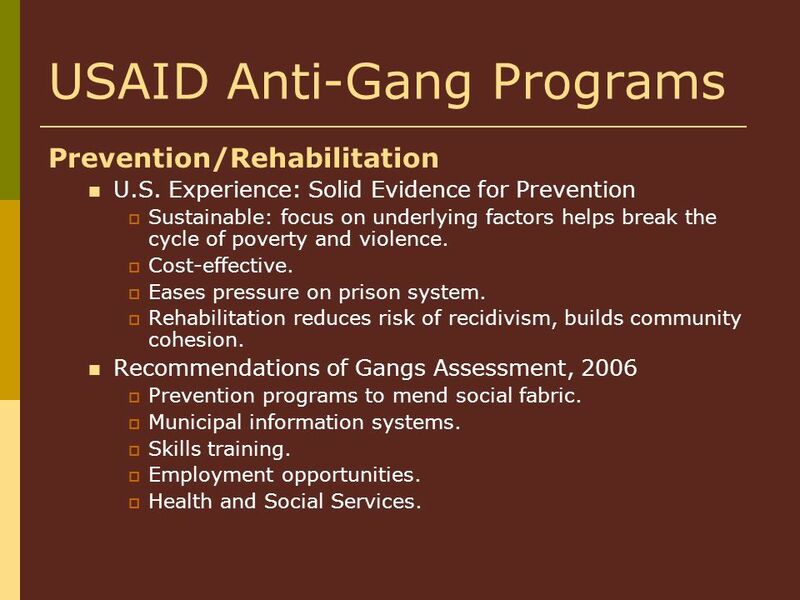 3 USAID Anti-Gang Programs Prevention/Rehabilitation U.S. 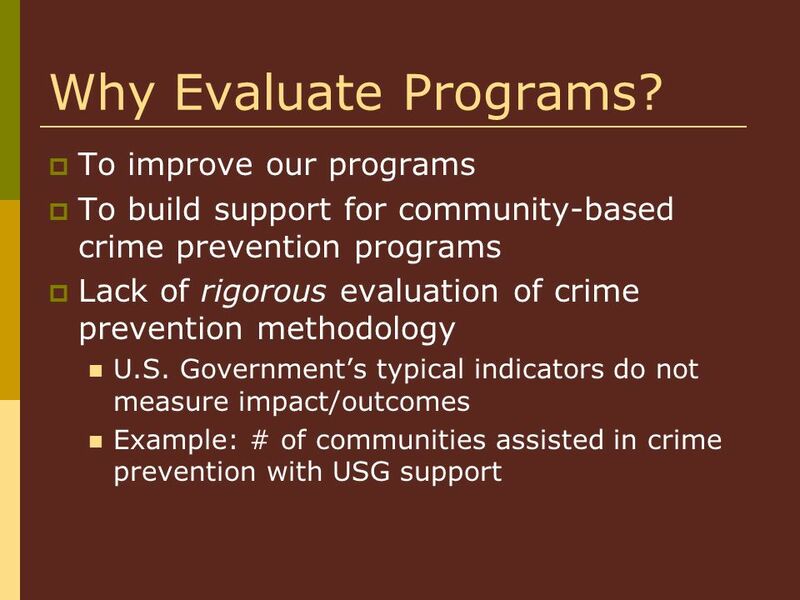 Experience: Solid Evidence for Prevention Sustainable: focus on underlying factors helps break the cycle of poverty and violence. Cost-effective. Eases pressure on prison system. Rehabilitation reduces risk of recidivism, builds community cohesion. 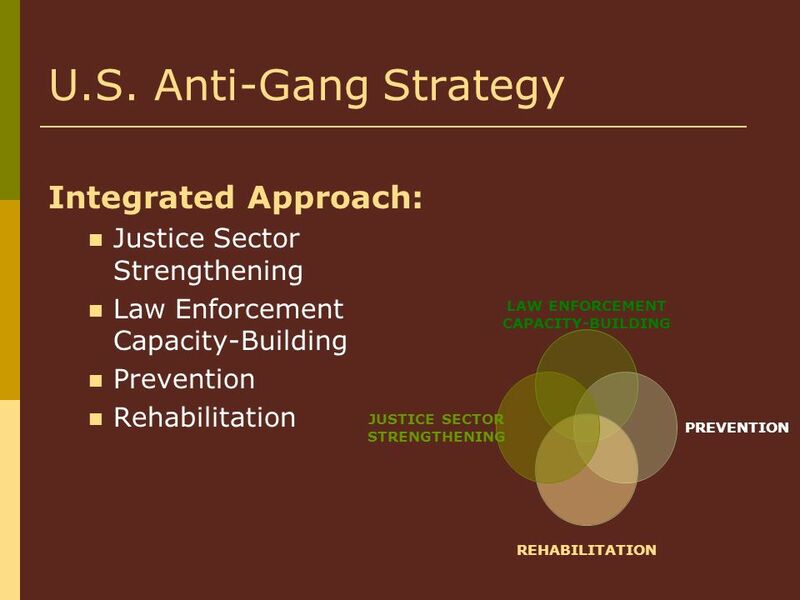 Recommendations of Gangs Assessment, 2006 Prevention programs to mend social fabric. Municipal information systems. Skills training. Employment opportunities. Health and Social Services. 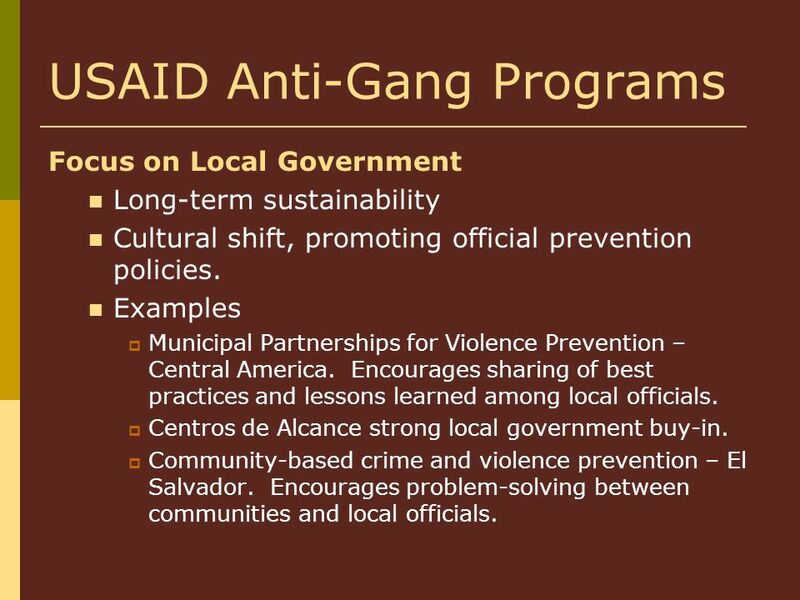 6 USAID Anti-Gang Programs Focus on Local Government Long-term sustainability Cultural shift, promoting official prevention policies. 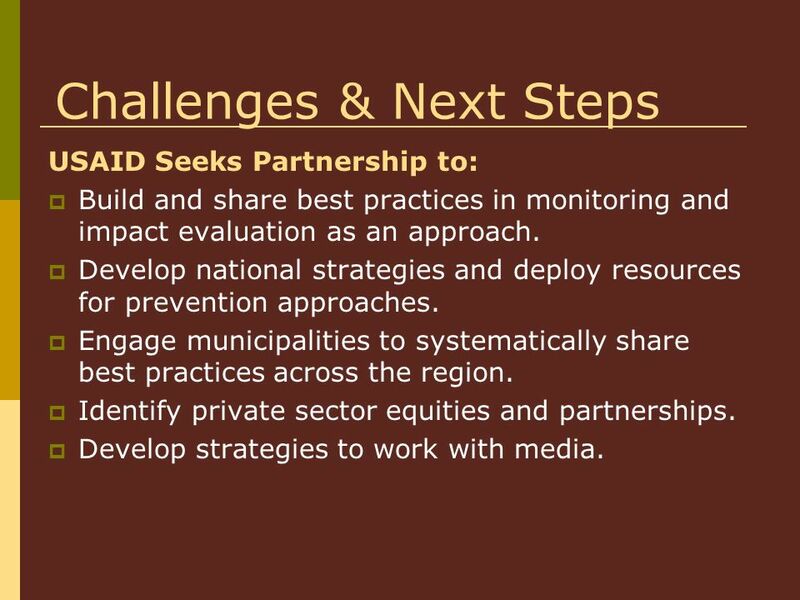 Examples Municipal Partnerships for Violence Prevention – Central America. Encourages sharing of best practices and lessons learned among local officials. Centros de Alcance strong local government buy-in. 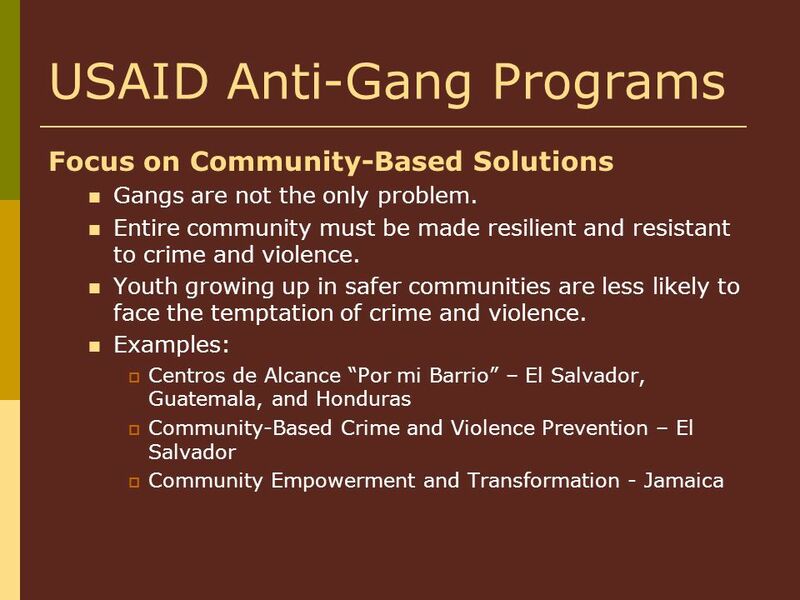 Community-based crime and violence prevention – El Salvador. Encourages problem-solving between communities and local officials. 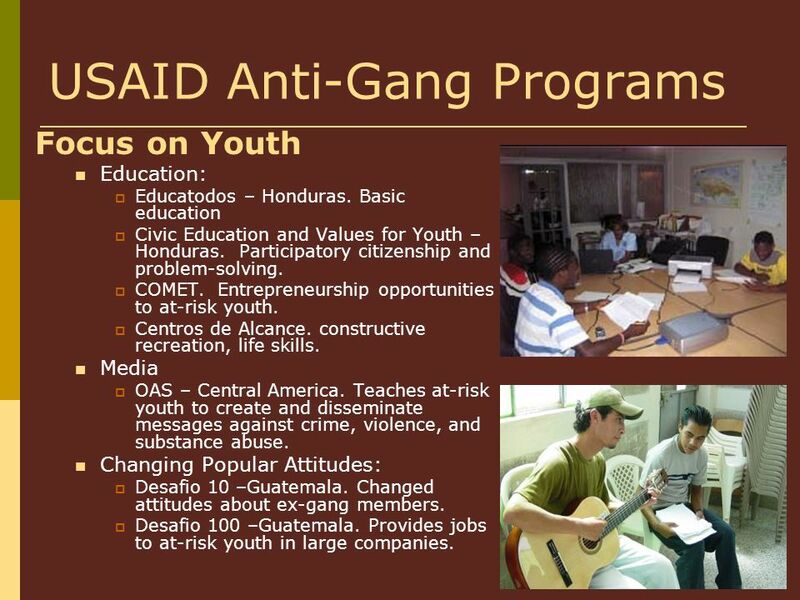 7 USAID Anti-Gang Programs Focus on Youth Education: Educatodos – Honduras. 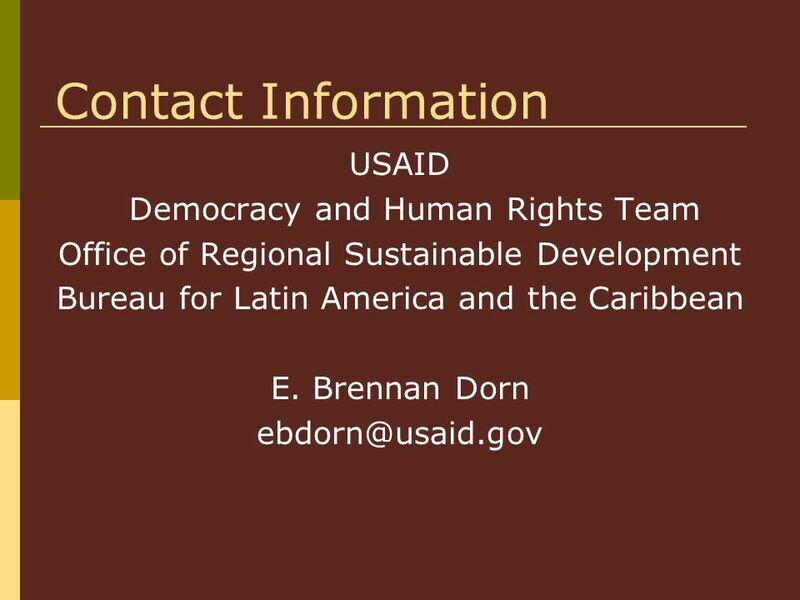 Basic education Civic Education and Values for Youth – Honduras. Participatory citizenship and problem-solving. COMET. Entrepreneurship opportunities to at-risk youth. Centros de Alcance. constructive recreation, life skills. Media OAS – Central America. Teaches at-risk youth to create and disseminate messages against crime, violence, and substance abuse. Changing Popular Attitudes: Desafio 10 –Guatemala. Changed attitudes about ex-gang members. Desafio 100 –Guatemala. Provides jobs to at-risk youth in large companies. 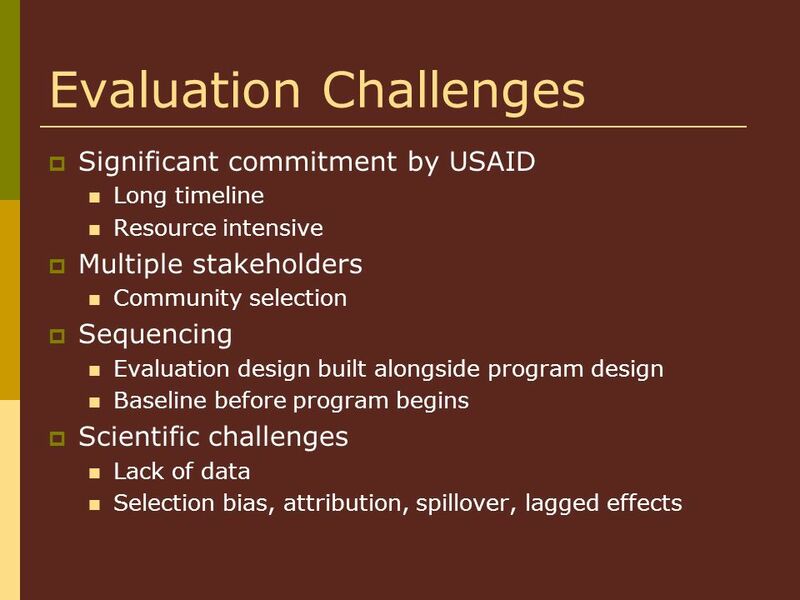 11 Challenges & Next Steps USAID Seeks Partnership to: Build and share best practices in monitoring and impact evaluation as an approach. Develop national strategies and deploy resources for prevention approaches. Engage municipalities to systematically share best practices across the region. Identify private sector equities and partnerships. Develop strategies to work with media. 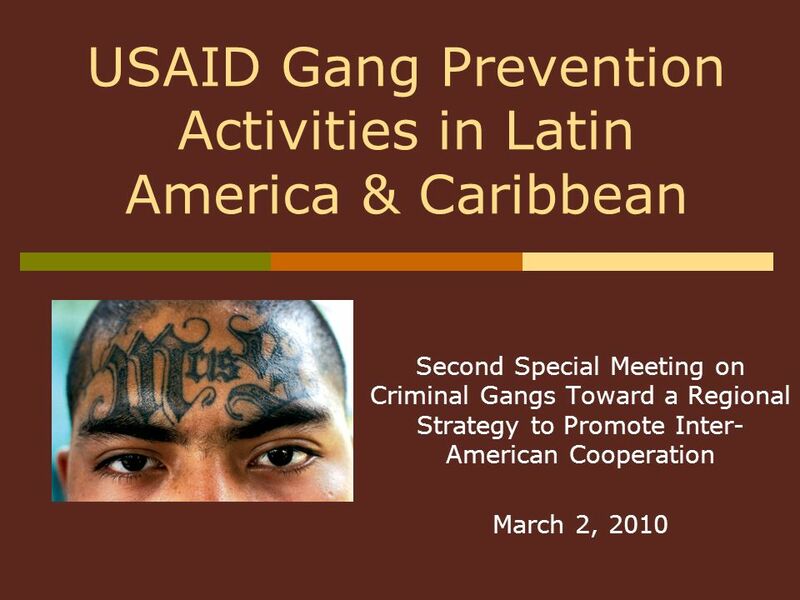 Download ppt "Second Special Meeting on Criminal Gangs Toward a Regional Strategy to Promote Inter- American Cooperation March 2, 2010 USAID Gang Prevention Activities." CARIBBEAN COMMUNITY CRIME PREVENTION AND SOCIAL DEVELOPMENT (CPSD) ACTION PLAN, Presented by: by Beverly Reynolds, Programme Manager, Sustainable. OAS-UNODC cooperation in implementing in the Americas the UN Survey on Crime Trends MISPA II, Santo Domingo 4-5 Nov 2009 Angela MeJose Manuel Martinez. Violence Prevention A CARICOM Developmental Imperative Izben C Williams, MD MPH. UNICEF and Violence Prevention Initiatives in the LAC Region. UNODC in Latin America and the Caribbean Videoconference UNODC – OAS Committee on Hemispheric Security 14 August 2008. Harold Pollack, Co-Director. 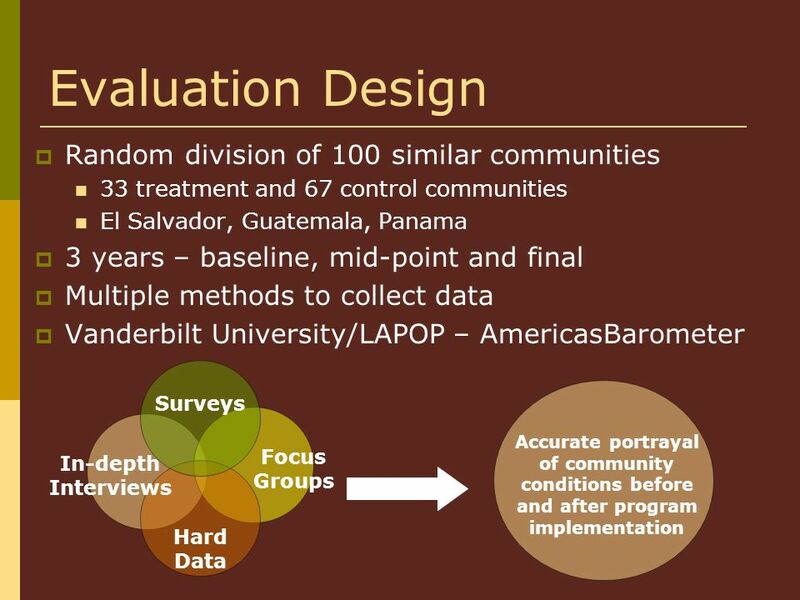 Founded in 2008 to partner with Chicago and other jurisdictions to carry out randomized experiments to learn more about. Going Global: Using Authentic Youth Engagement to Advance International Advocacy and Policy Reform Jim Casey Youth Engagement Summit August 6, 2014. Towards the Romania of PRINCIPLES OF PROGRAMMING The social and macroeconomic policy of Europe is the policy of Romania EU projects represent a. Supporting and Engaging Families through the Intervention of Law Enforcement Presented by: Laurie Cavanaugh, G.E.A.R. Parent Network Regional Parent Support.